Making a right turn is pretty straight forward. Simply extend your right hand to let the people around you know that you are turning right, and then turn right as shown in this video. The only confusing thing about turning right is that turning right at a red light is not allowed. You will see many people do it anyway, but legally you are not ever allowed to turn right at a red light. 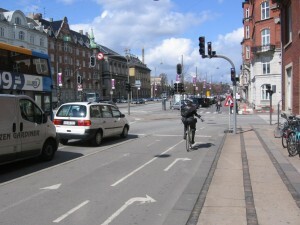 If you are a visitor to Copenhagen, then you should respect their laws and not turn right on red. To quote the Deputy Chief Superintendent of the Traffic Unit in the Copenhagen Police, John Sckaletz, “Obey the law or leave the country”. This entry was posted on Sunday, May 9th, 2010 at 8:09 pm	and is filed under How To's. You can follow any responses to this entry through the RSS 2.0 feed. You can leave a response, or trackback from your own site.